"Om vrim brihaspataye namah" •The mantras are chanted on japa beads of 108 beads per string. They are similar to rosaries. 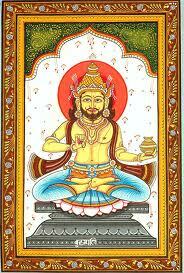 The Jupiter's mantra may be recited for 19,000 times and puja performed with yellow flowers. Begin recitation on a Thursday during the bright half of the Moon. Presence of 'Ganesh yantra' at the place of recitation may help you in achieving the desired results faster. "Om Suraachaarya Vidmahe, Surasreshtaya dhimahi, tanno guruh prachodayat“ •This Gayatri mantra consists of three parts. The first is the chants to the Jupiter. The second is the mantra proper. The third is a summary of the mantra's energies. The Gayatri mantra is chanted at sunrise, noon and sunset. At dawn it is called Gayatri, the youthful form of the Goddess, consort of Lord Brahma, the creator. It is called Savitri, the mature form, at noon, the consort of Lord Shiva. It is called Sarasvati, the elderly form, at sunset, the consort of Lord Vishnu. You may also opt to chant following Puranic mantra for propiating the Jupiter (19,000 times). "I bow down to Brihaspati, god of the planet Jupiter. He is the spiritual master of all the demigods and sages. His complexion is golden, and he is full of intelligence. He is the controlling lord of all three worlds."